Lenovo announced today that it's making a bold step into the Chromebook market, which is great news if you're an elementary school student or a teacher though not so much if you work outside the classroom. 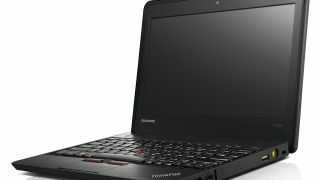 For Lenovo's first foray into Google's operating system, it's launching the ThinkPad X131e Chromebook, a Chrome OS laptop built specifically for K-12 schools. To survive in that kind of educational environment, the ThinkPad X131e Chromebook is a tough piece of hardware, with a rubber bumper built into the top cover and reinforced corners to help it survive the occasional - or frequent - accidental fall. The hinge has also been strengthened and Lenovo claims it can safely withstand being opened and shut more than 50,000 times. The ThinkPad X131e Chromebook's key benefit is from the Chrome OS itself, giving the laptop fast boot times and battery life that can last the entire school day. It will rely on Google Apps for Education and the Chrome Web Store for applications, which will provide all of the necessary tools for students like creating documents, spreadsheets, and presentations. Since the ThinkPad X131e Chromebook is meant for K-12 education, Lenovo is only selling the laptops directly to schools and institutions priced at $429 (EU£268, AU$406). Interested educators can place bulk orders for their school starting Feb. 26. Despite it's limited in release, could Lenovo be testing the Chrome OS waters for a future entrant aimed at a wider audience? We hope so, though perhaps without the extra padding. We're not that clumsy.